While I'm quite sure you all have your Thanksgiving menus made and already bought your ingredients, right? LOL!! If you're like me, you just want to get past this election before planning holidays. It's really just taking the fun out of November. But to take your mind off it, think about this instead. Salted Caramel Pumpkin Cheesecake. YEP! It's all there. Pumpkin, cheesecake, salted caramel and you can even pretend it's healthy since the crust is full of honey-sweetened, almondy, coconutty goodness instead of enriched white wheat flour and white sugar. As I was standing at Starbucks yesterday I realized that there are certain things that I relegate to one time period and one time period only. Pumpkin anything, for instance, is strictly reserved for Thanksgiving or at the very furthest extent, fall. Once Christmas decorations are up, pumpkiny things are put on the shelf til next fall. Chocolate Peppermint takes over at that point and I don't even know why. I suddenly want Peppermint mochas and this Flourless Peppermint Chocolate Cake (actually I was trying to locate a different recipe that I had made before but couldn't find it and stumbled across this one instead. SQUIRREL!!). Now neither of these are paleo friendly and I have been trying to stick to a healthier eating plan since finishing The Whole30 in mid-October but that doesn't mean the taste memories aren't there and I won't try to figure out how to make something that resembles them but are healthier. Stay Tuned! Anyway...this cheesecake is the result of many recipes being combined. I liked the ginger spiciness of gingersnaps instead of the typical graham crackers that I found in one recipe and I liked the caramel topping of another recipe then I wanted a cheesecake that actually had pumpkin in it, not just the spice. So with a little kitchen magic, I came up with this on one try. I will give you step-by-step to making a successful, no-crack cheesecake, but if it does crack, simply add more caramel to the top and cover with chopped pecans or pulverized ginger snaps. As we all know caramel can cover a multitude of kitchen "sins". Mix the cream cheese on medium high until it is creamy then add the sugar, pumpkin and spices. You want it to be well blended with NO lumps before adding eggs! 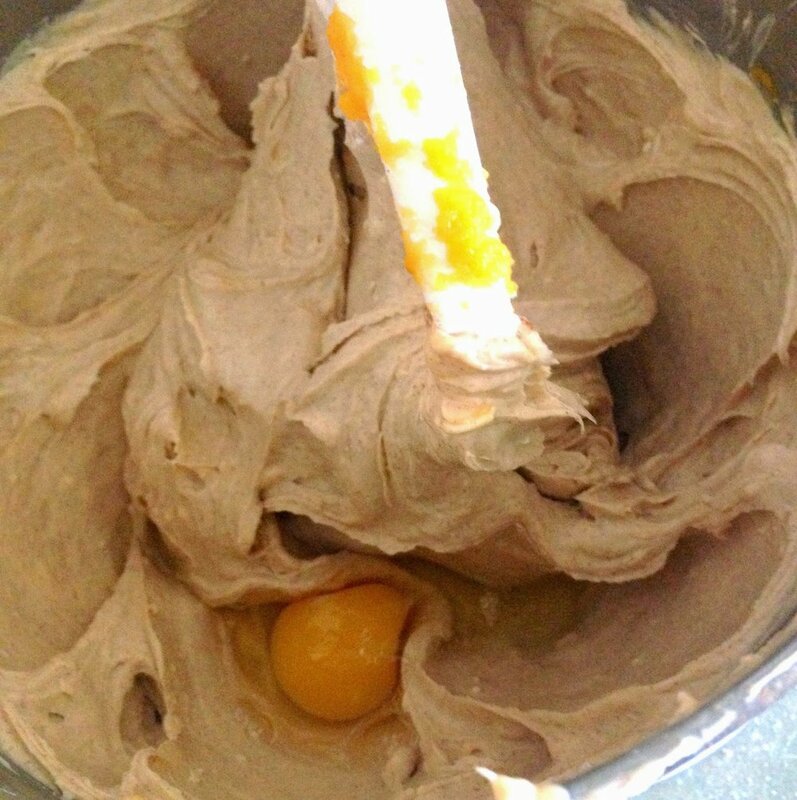 Blend very well after adding each egg, then scrape the bowl before adding the next one. Bake at 325 degrees for 45 minutes or until the center is just set (still a little jiggly.) Turn off oven, but crack the door open. Leave cheesecake to cool in residual heat of the oven and water bath. Cover with plastic wrap or foil and place in refrigerator to chill for at least 4 hours but preferably 8 or more. Spread caramel on top while the ring is still around the springform pan. Carefully slide a knife or offset spatula around the edge of the pan to loosen the cheesecake. Place on top of a serving plate, then loosen the ring and remove. Wrap the bottom of a 9" springform pan in foil to prevent any leaks. Press into the bottom of prepared pan. Bake for 12-15 minutes or until light brown and crunchy. Beat the cream cheese on medium high speed until creamy. Add the sugar, pumpkin and spices. Mix again until smooth. Add eggs, one at a time, scraping after each addition. 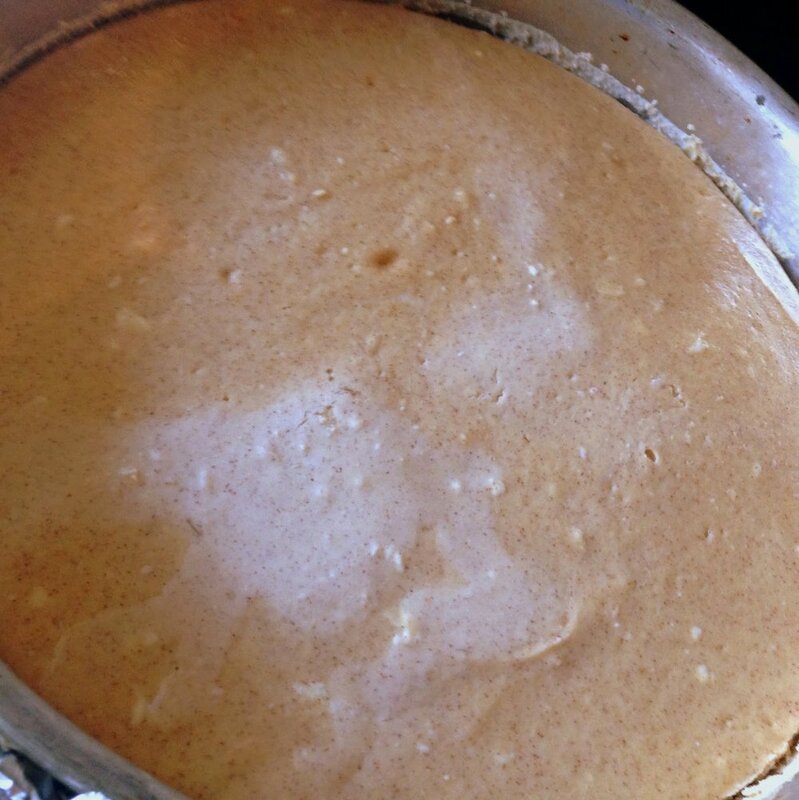 Pour the batter into the crust and tap on counter a few times to release air bubbles. Place the springform pan (wrapped with foil) in a larger baking dish and place on rack in oven. Add water to come up 1/2 inch on the sides. Once completely cool, cover and place in fridge to chill. 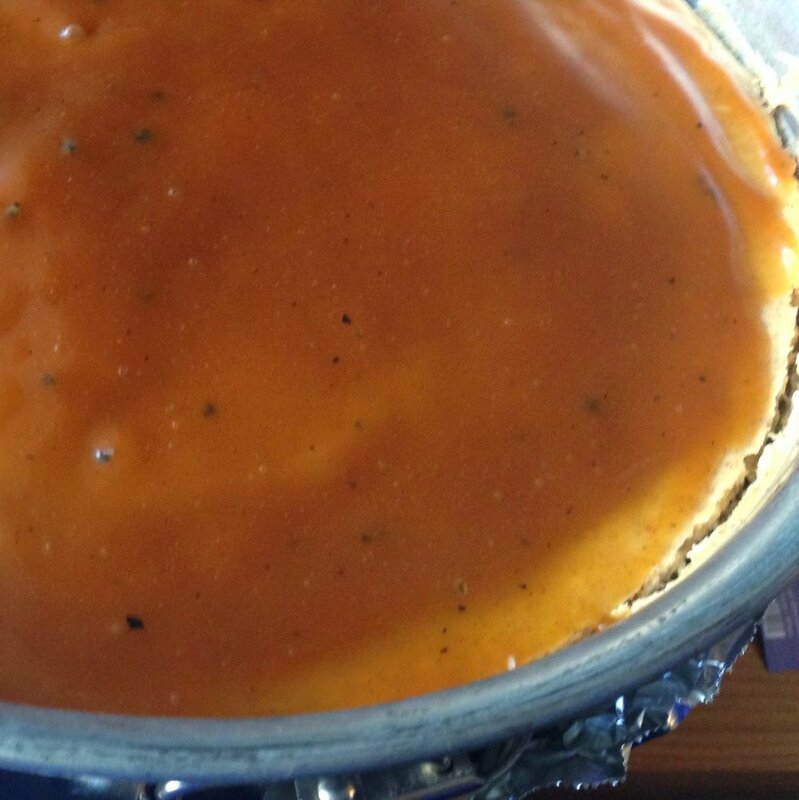 While collar is still around pan, pour the caramel over the cheesecake and level with a knife. Place back in fridge to set then use a knife dipped in water to slide around the outside of the cheesecake to loosen from collar. In a heavy large saucepan, heat the sugar without stirring. As you begin to see the sugar turn amber around the edges, stir it gently to incorporate the melted sugar with the unmelted then let it sit again for a few minutes until it’s fully melted together. Watch it at this point because it could over-brown quickly. You want it to be a light brown color. When it reaches this stage, carefully pour in cream. It will foam up quickly and put off a lot of steam so keep your hands away after pouring it in. Once it has died down, stir in the cream to full incorporate it. You may have to whisk over low heat if sugar seizes up to get it to fully integrate into the cream. Be patient, it will happen. Once the caramel has come together and sugar is fully melted, stir in sea salt and butter until incorporated.